The 2014 Kia Cadenza is Kia's new premium sedan with a 293 horsepower all-aluminum 3.3-liter V6 engine mated to a six-speed, sport-tuned automatic transmission that will be offered in one trim level with a starting MSRP of $35,900 (including $800 destination and handling), when it goes on sale later this month. The Cadenza offers Luxury and Technology option packages. The Cadenza with Luxury Package is priced at $38,900 MSRP with a full-length panoramic sunroof and power retractable sunshade, Nappa leather trim with heated rear outboard seats and ventilated 12-way adjustable driver seat, HID headlamps with adaptive front lighting system, a seven-inch LCD instrument cluster for superb clarity and customization, a heated steering wheel with power tilt and telescoping capabilities, and two-position memory setting for driver's seat, outside mirrors, and steering column. 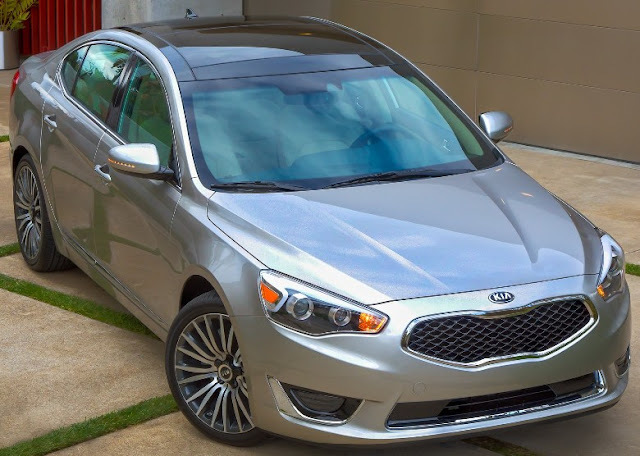 The Cadenza with Technology Package has 19-inch alloy wheels, an electronic parking brake, Advanced Smart Cruise Control, a Blind Spot Detection System and Kia's first-ever Lane Departure Warning System for $41,900. The front side windows feature hydrophobic technology, which repels water for enhanced visibility during rainy weather conditions. The Lexus LS 460 F Sport AWD with its 386 horsepower 4.6 liter V8 engine mated to an 8 speed transmission is a sportier version of the new fifth generation Lexus luxury sedan aimed at taking on the German all-wheel drive sedans head on with a price that starts at $85,780 (including $895 delivery, processing & handling fees). The F designation is inspired by Fuji International Speedway which translates to performance, and, in this case, attractive luxury performance. The F Sport model sits 10mm lower than the other LS models, has a more aggressive-looking exterior, sport tuned air suspension, special sporty heat and cooled seats, a leather-wrapped steering wheel with paddle shifters and aluminum trim, Brembo six-piston caliper brakes and 19” forged wheels. I tested the LS F Sport AWD pre-production all-wheel drive prototype which was a dream to drive. The Lexus LS 460 F Sport AWD drive took me around Atlanta with elegance and pride to a variety of special venues. My seasoned critical friends who rode in the backseat were impressed with the roominess, comfort, numerous ventilation outlets, two pulldown ceiling mounted lit vanity mirrors and the view of the front dashboard's expansive 12.3-inch, split-screen, high-resolution multi-media display on the front dashboard showing off numerous functions from radio to climate controls. My front seat passenger could not believe how the split climate controls actually made a difference, while the driver side was cool, the passenger seat area was much warmer. The incredibly quiet cabin, chrome-plated gas and brake petals, choice of heated or cooled seats and steering wheel warmer along with the automated trunk opener and trunk closer button were some of what-seemed-like endless features, along with auto-folding mirrors that pulled in when the car was parked. Also, on that list, was the choice of ride functions, ECO, normal and sport. In ECO mode, the throttle response and engine power output are moderated for increased fuel efficiency. The long distance test was my drive from Atlanta to Augusta, Georgia, for the 2013 Masters golf tournament and back to Atlanta, about 300 miles round trip on the well-kept smooth highway 20. 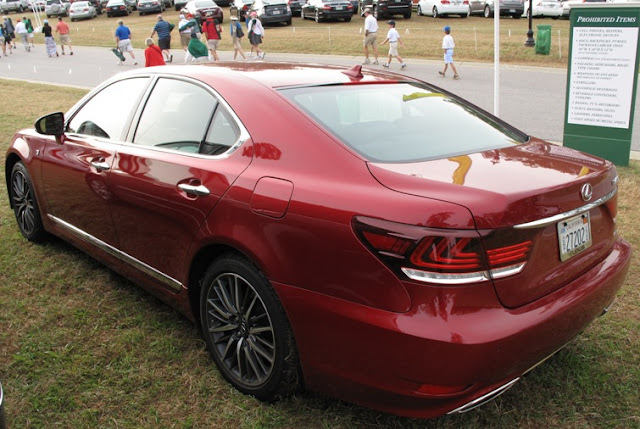 The LS 460 F Sport does draw attention, like from an inquisitive highway patrol officer who pulled up to my rear bumper at highway speed to check out the vehicle, luckily without pulling me over for a closer view. The all-wheel drive may have been helpful in getting out of the rain drenched grass and gravel Augusta National parking lot. The real test was the Sunday evening drive home after spending an amazing two days following the world's best golfers around. The comfort of the cabin and seats combined with an over-the-top audio system made the two-and-half hour commute an enjoyable, tireless breeze that could have continued. 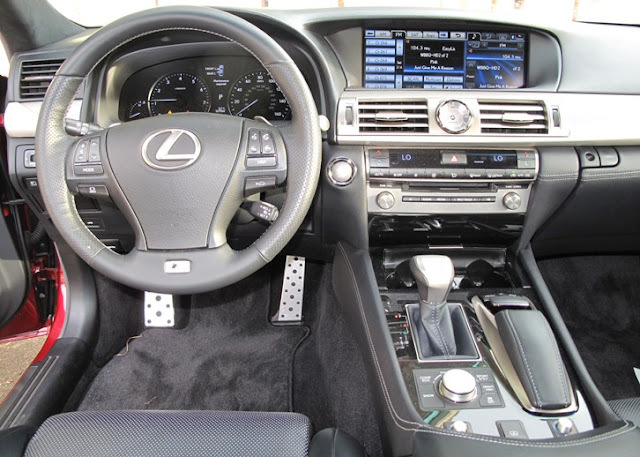 Bottom line: This is the highest end Lexus sedan, surpassed only in price by the LS 600h L, that caters to a gadget-hungry, performance pamper-seeking driving connoisseur who wants an all-wheel drive and prefers a Japanese over a German car. 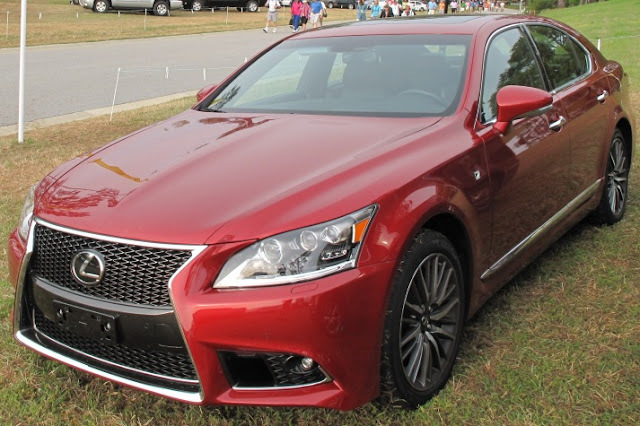 The Lexus LS 460 F Sport AWD is a lot of car for under $86,000. The Lexus ES 350 will be the first Lexus vehicle produced in the United States with Toyota investing $360 million in its Georgetown, Kentucky plant that will generate 750 new jobs to manufacture about 50,000 Lexus vehicles a year bringing the plant's total annual production capacity to more than 550,000 vehicles. It will be the first time the ES will be assembled outside of Japan and production will start in 2015. 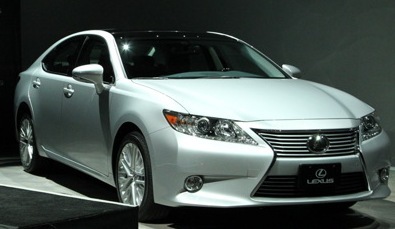 Lexus has been manufacturing its popular RX luxury compact SUV in Cambridge, Ontario, Canada, since 2004. Test driving the Mazda CX-5 was like trying to review a movie that had already won all the big awards - was it deserving and does it meet my forty-plus years of refined driving idiosyncrasies? Answer: YES for this 2014 CX-5 Grand Touring front wheel drive model. And, the toughest critic of all, my wife, was sold on it, too. Neurolingusitic programming (NLP) experts profess that people prioritize the senses which they use to interpret the world with the main three being visual, auditory and kinesthetic. So by appealing to all the senses you can create a product that will be a success. The Mazda CX-5 appeals to all the senses by looking and sounding great and feeling solid and luxurious. It also hits the important automotive criteria - my 5 P's - price, performance, purpose, pampering and proximity (to the dealer). Proximity may or may not be an issue to the buyer but keep in mind you do have to get the car serviced somewhere to keep the warranty valid. Pampering covers ride, comfort and features. Mazda has successfully blended 4 of my 5 P's into their so-called Skyactiv Technology, which they say "combines breakthrough innovation and state-of-the-art engineering and is applied to engines, transmissions, body and chassis systems - all lighter, more efficient, with increased responsiveness" or more simply put, Mazda has a practical fuel efficient vehicle that satisfies a wide range of buyers' tastes and needs. Originally introduced with a 155 horsepower 2.0 liter engine at the 2011 Los Angeles Auto Show, Mazda now offers the CX-5 with an all-new 184 horsepower SKYACTIV-G 2.5-liter gasoline engine for the Touring and Grand Touring models giving them nearly 19 percent more horsepower and 23 percent more torque. The more powerful CX-5 debuted at the 2012 Los Angeles Auto Show. I test drove the 2014 CX-5 Grand Touring front wheel drive model with an exterior Meteor Gray Mica color and black leather trimmed interior with the $1,625 Grand Touring Tech package and two optional add-ons, a $100 rear bumper guard and $200 retractable cargo cover bringing the total MSRP to $30,340 (including the $795 delivering, processing and handling fee). My 600 mile week long test drive included two round trips from Los Angeles to Palm Springs darting in and out of traffic on Southern California freeways that included the hilly 60 freeway and some unavoidable bumper-to-bumper, start-and-stop traffic. My 600 miles in the CX-5, mainly on the highway, achieved more than 30 miles per gallon and was comfortable for me, the driver, and my passenger for the 2 hour plus commute. The 14.8 gallon fuel tank capacity in the front-wheel drive CX-5 model that I tested would have taken about 400 miles had I let run to empty. 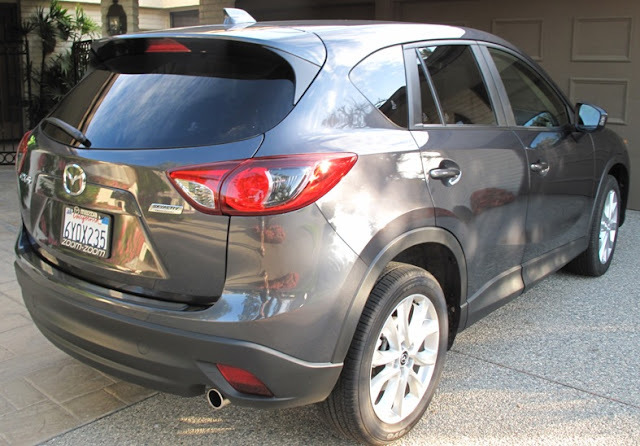 My objective in every review is to determine whether I would buy this car, specifically, I wanted to see if the CX-5 would be the ideal vehicle for downsizing from a larger SUV by providing enough space with much-improved fuel economy and it did. My first impression was the beautiful lines and look (visual), the quality sound of the door closing and great Bose sound system (auditory) and, maybe, most of all, the solid feel behind the wheel (kinesthetic). The ride felt firm, not floaty, which helps carsick-prone passengers avoid feeling nauseous. On that note, when you get your new CX-5 or any vehicle with voice activated features, learn the instructions on your own before subjecting passengers to ongoing misinterpreted voice commands. The telematics were intuitive with a quick cellphone bluetooth sync. The 34.1 cubic feet behind the second-row seats took luggage for 3 people that included a folded wheelchair and walker for my mother who could easily enter and exit the CX-5's 2nd row seat because of the low step and good accessibility. Visibility was much better than expected and the rear camera reverse feature was excellent. 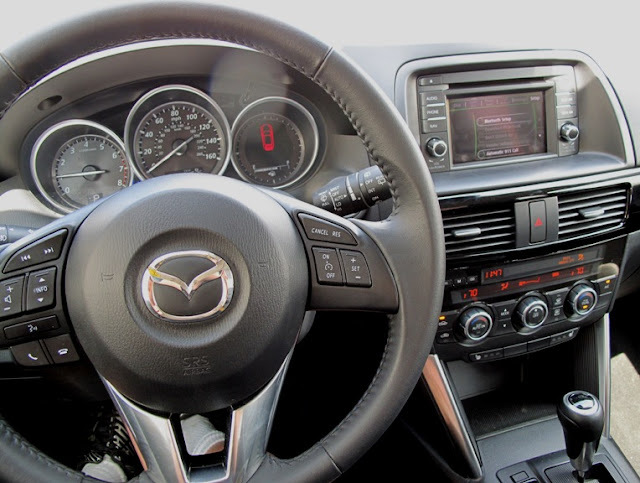 The ergonomics were good with intuitively-placed steering wheel controls and the 5.8-inch in-dash touch screen providing access to Bluetooth phone and audio connectivity as well as iPod audio playback. The nine-speaker 225-watt Bose sound system came through crystal-clear with a variety of listening choices like digital AM and FM radio, Sirius and Pandora. My KNX buddy Frank Mottek sounded even better. Bottom Line: Mazda has sold 17,811 CX-5 vehicles in the first three months of 2013 after a record sales month in March. The 2014 CX-5 Grand Touring front wheel drive model at a $30,340 MSRP with its IIHS Top Safety pick and virtually every vehicle tech feature that you could want or need, fully deserves all the accolades as a fuel efficient city and highway multi-purpose crossover that still has the benefit of a firmer ride with confident handling and plenty of cargo space. The redesigned 2014 Hyundai Equus premium luxury sedan powered by a 429 horsepower 5.0-liter Tau DOHC V8 engine mated to an 8-Speed automatic transmission with SHIFTRONIC, has a new 19-inch turbine-blade alloy wheel design, thinner front grille chrome bars, new front fascia, a 7-inch Thin-film Transistor LCD center cluster display for Signature models, a large 12.3-inch, fully-digital TFT LCD center cluster display for Ultimate models, and a larger, standard 9.2-inch center instrument panel LCD display. Fuel economy is estimated at 15 mpg city, 23 mpg highway and 18 mpg combined. Hyundai will continue to offer “Your Time, Your Place” at-home vehicle demonstrations, “At Your Service” valet service appointments and an interactive owner’s manual app for Apple iPad. The BMW Concept X4 is a preview of the future of the BMW X family that blends the BMW SAV with a BMW Coupe following the X6 but in a new vehicle class. The BMW X4 has a body length of 183 inches, a width of 75.4 inches and a height of 63.9 inches with 21 inch light alloy wheels. 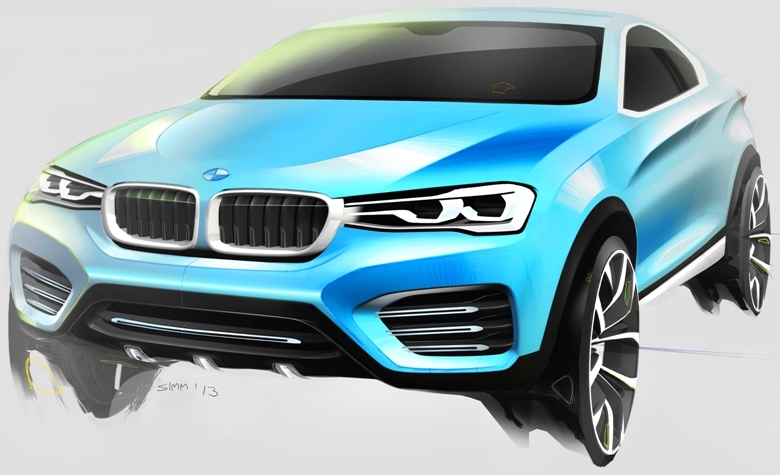 The X4 Sports Activity Coupe production model is scheduled to roll out of the U.S. BMW Spartanburg factory in 2014. General Motors sold 245,950 vehicles in the United States in March, up 6.4 percent compared with a year ago. Retail sales increased 4 percent, fleet sales were up 12 percent and the fleet mix was 27 percent of total sales. Year-to-date total GM sales are 664,963, up 9.3 percent. Ford Motor Company sold 236,160 vehicles in March, a 5.7 percent increase over March 2012 for the best sales results since May 2007, and year-to-date Ford has sold 598,483 vehicles, an 11 percent gain over the first quarter of 2012. Toyota Motor Sales U.S.A. reported March 2013 sales of 205,342, up 1.0 percent over the year-ago month. For the first quarter, TMS reported sales of 529,444, up 8.7 percent on an unadjusted raw volume basis. Chrysler Group reported U.S. sales of 171,606, a 5 percent increase compared with sales in March 2012 and the group's best monthly sales since December 2007. Year-to-date sales are 428,352, an 8 percent increase over 2012. Nissan North America reported March U.S. sales of 137,726, up 1 percent from last year's total and marking the best month in NNA history. Nissan Division also posted its highest volume month ever, with 126,623 deliveries, up 0.4 percent. Infiniti deliveries totaled 11,103, up 9 percent from last March. Year-to-date sales are 318,281, down 1.3 percent from the quarter of 2012. Hyundai Motor America March sales of 68,306, down just two percent versus the best volume month Hyundai ever recorded last year. The first quarter of 2013 was the best in Hyundai's history with sales of 164,330, a drop of less tha half a percent from the first quarter of 2012. Kia Motors America reported March sales of 49,125, down 14.6 percent from March of 2012. Year-to-date sales are 126,932, down 8 percent from the first quarter of 2012. Volkswagen of America reported sales of 37,704 in March, a 3.1 percent increase over prior year sales and best March since 1973. Year-to-date sales are 98,178, a 4 percent gain over 2012. Separately, Audi reported March 2013 sales of 13,253 vehicles, a 14.4 percent increase over the previous March record set last year. Year-to-date Audi sales are 34,186, up 16 percent over the first quarter of last year. Subaru of America reported 36,701 vehicle sales for March 2013, which represents the best-ever sales month for the company and a 13 percent increase over March 2012. Year-to-date sales for Subaru total 92,527, a 15 percent increase over the same period in 2012 and the best first quarter in company history. Mazda North American Operations reported March U.S. sales of 32,028 vehicles, a decrease of 1.1 percent versus last year. Year-to-date sales of 78,283 through March are down 4.6 percent versus last year. The BMW Group in the U.S. (BMW and MINI combined) reported March sales of 33,149 vehicles, an increase of 11.2 percent from the same month a year ago. Year-to-date, the BMW Group (BMW and MINI combined) sales of 78,957 is up 4.3 percent over the first three months of 2012. Mercedes-Benz USA reported record March sales of 24,646, a 6.5 percent increase over March 2012, resulting in year-to-date sales of 69,187, up 12.5 percent. Combined sales of Mercedes-Benz passenger vehicles, smart and Sprinter for the month totaled 27,104, up 6.3 percent, and year-to-date up 12.4 percent at 75,214. Porsche Cars North America announced record March sales of 3,487 vehicles, an increase of 41 percent. For the year so far, PCNA has delivered 9,650 vehicles, an increase of 34.8 percent, marking the best first quarter in PCNA history.